This week’s Theme Thursday is Palm. Let’s go way back to 1997 when we didn’t have to bring a note from our mother and get stripped searched at the airport. Back when the British had to give back Hong Kong to China because the rental lease was up. WOW! Amazing. 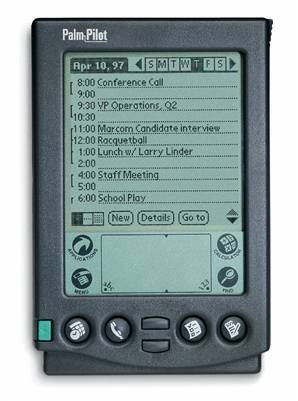 My days were so busy back then that I needed a palm pilot. No phone, no app of a roaring fireplace to set out for Thanksgiving, no games, no death ray, none of that fun stuff! How on Earth did this stuff even take off? And what’s with the name to begin with? Palm pilot? I really don’t want my palms flying anywhere without me. In fact, my palm only has one purpose. Oh, get your minds out of the gutter. Puleez! You know, to remind me what color I was before the summer sun turned me into a born-again Jamaican. Remember folks, it’s only been 13 years since this device came out and now we see it as simplistic and goofy. Imagine what we’ll think of the Apple 4 in 13 more years? Mine died. I recently replaced the batteries, I realized all the data was then gone. I looked at it and wondered why the hell should I even bother to reinput the data when I was not even sure how long ago the batteries died. And so there it sits, all alone, empty, waiting for the batteries to die again. Big sigh. I had one, but I kept losing the stupid stylist. Thank goodness I don't have to use one with my iPhone. Does any device use them anymore? Heh, I can't make out the screens on these anyway...I'm still attached to good ol' pen and paper. What? Never had a palm pilot... I can forget things easily all on my own, without first writing them down on an expensive calendar! Nope, I never had a Palm Pilot either. The only people I knew who had them were the hyperactive, always on the move, gottagogottago super marketing types with blood pressure readings through the roof. You know, the same ones who now run around with BlueTooth plugs in their ears, the ones who think they're too important to the rest of the world to ever be out of contact. As far as I was concerned that was just plain bad advertising; if those dweebs needed one then there was no way I was even going near one! And to think, it couldn't even play MP3s! I do remember having a battery-powered 3.5-inch floppy drive for one of my HP calculators, though. Hell, I didn't even have a cell phone until 2006, and I don't text or Twitter (or "Tweet"), or any of that other stuff. actually this is precisely what I need. And also, I need it to make phone calls, and possibly also take photos. That's it. And maybe visit the internet and check my emails. Yeah. That's it. we have come such a long way havent we...i rather like to play pong still...smiles. Mrsupole – That’s the trouble…who wants to enter all that stuff in just to lose it and have to start all over again? austin - You must be an official gadget guy! Do you have the secret blue-tooth decoder ring? My first Theme Thursday is posted. LOL ... I loved this! I remember wanting one so badly. Sadly my to do list would have ben much more boring. *smiles* Happy TT! think of all the money i'm saving by not having any of this crap. Hubby liked his for awhile but I think he got tired of lugging it and a phone around. I wished I could afford a Palm Pilot. I didn't even have a computer back then. Wow, thanks for the memories! Happy Theme Thursday. I'm with Subby; pen and paper is still my favorite. Pencil and paper, if I seem to be making a lot of mistakes that day. Stranger – No computer by 1997? Wow, that’s almost like saying you didn’t have indoor plumbing or that you had to shred your own cheese! My mind wasn't in the gutter until you put it there! I still don't have touch tone on my land line, let alone a touch phone. That was one thing I never bought into I dont know why not but I didnt. Maybe because at that point in my life I didnt need an address book even so why would I need a palm pilot? In fact this year is the first year that I actually got into....dum dum da a blackberry phone.....and guess what? I cant even figure out 2/3rd of how to work it. But my question to you is do you really think it will take 13 more years for the Apple 4? oh heck now they have "smart boards" in the kids' classrooms instead of chalkboards. so if there is a power or tech failure they can't even use the chalkboard. You're right, what's next? Never had a palm pilot, i struggle enough with the iPhone I'm such a technodolt. it's been that long since the palm came out??? baino - There's nothing wrong with being a technodolt! Peter and I were just talking about these the other day! It's amazing how technology has changed so much just in the past 10 years. It makes me feel so old. I had a Handspring Visor. Loved it. LOVED it!